Lhakhang Karpo can be distinguished by its white walls while Lhakhang Nagpo has grayish-black walls. The former was established in the 7th century by Tibetan king Songtsen Gempo in his mission to build 108 monasteries in one day. 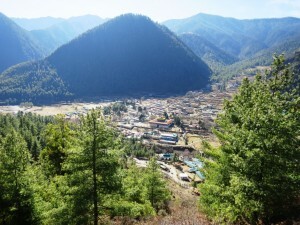 He built Lhakhang Karpo and Lhakhang Nagpo in the Haa Valley. According to a legend, a black and a white pigeon were released to select sites to build the temples.